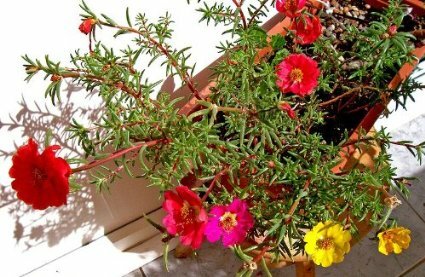 Portulaca grandiflora is a half-hardy annual suitable for growing in borders and rock gardens. Native to Argentina, southern Brazil, and Uruguay, it is a succulent plant with semi-prostrate red stems. It is a small, but fast-growing plant growing to 30 cm tall under favourable conditions however this is usually around 15 cm under garden conditions. The narrow, fleshy leaves are cylindrical in cross-section and bright green in colour. Each leaf can be up to 2.5 cm long, and arranged alternately or in small clusters. The saucer-shaped blooms are approximately 2.5-3 cm across with a central boss of bright yellow stamens. The blooms can emerge in a variety of colours, most notably red, purple, yellow and white. Numerous cultivars have been developed producing forms with additional petals, double flowers and increased variation in flower colour. Plant portulacas outside in May, and only then once the threat of late frosts have passed. They will perform best in any well-drained garden soil, thriving under hot, dry conditions in full sun. Consider adding a general purpose, high nitrogen fertilizer when first planting, with a second addition of high Phosphorous fertilizer just before the plants come into flower. When planting in groups, spaced at a distance of 30 cm apart, and deadhead spent flowers to promote more blooms. 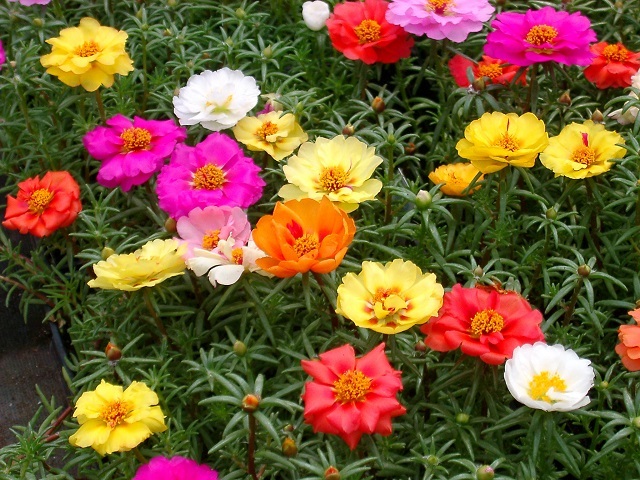 Portulaca will only require watering when the plants show signs of wilting. WHEN DO YOU CUT BACK A LEYLANDII HEDGE?